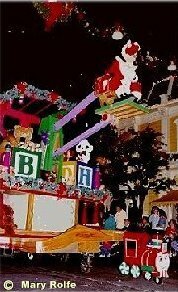 Goofy rides high in the Very Merry Christmas Parade. Those white dots against the night sky are not due to faulty film. That's snow. You have to see it to believe it. Only Disney can make a snow storm when it's that warm outside. Of course, it was accompanied by marchers and music.